Ruby Tech Corp., the leading and innovative fiber optic networking manufacturer based in Taiwan, today unveils 100M Fast Ethernet ExpressCard Fiber NIC – FE-6510. FE-6510 is a small size Express 100Base-FX Fiber Card, which is specifically designed to plug into a notebook or desktop computer equipped with an Express Card slot and is designed with high-performance Express Fast Ethernet controller. It provides fiber optic link capability for notebook PC to connect the existing fiber network at 100Mbps data rate with fiber optic cable. It also provides multiple types and distances of fiber connector for optional. The maximum fiber optic cable distance can be up to 2Km for multi-mode and 20, 40 and 60Km for single-mode fiber, and 50m for plastic optical fiber. Diagnostic LED is easily visible for maintenance purpose. Extensive Network Operating System (NOS) drivers such as NetWare, Windows 98/NT/2000/XP/Vista/2003 server/2008 server/WIN 7 , Linux and PXE remote boot are available. 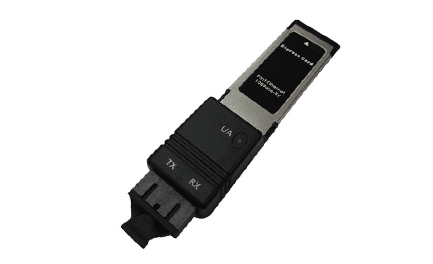 Ruby Tech also supplies Gigabit ExpressCard, GE-6600 , and PCI Express NICs, GE-4000 and FE-2200.